Very soft to the touch. On very hot days (>25 deg centigrade), I felt the material may have been a little too 'warm'. (This may partly be down to the colour, of course.). Tester: Female, 5' 9", slim build. 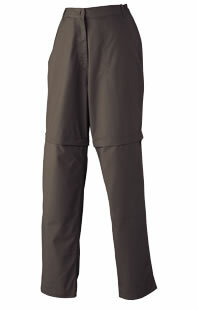 Fits snuggly at waist and hips - waistband is elasticated at sides. Length of trousers is good. Lower legs are easy to remove - leaving shorts which are also an excellent length. Four pockets in total. Once medium sized, velcro-sealing one at the back. Two good sized side pockets at the front; one zip fastened pocket on the right hand, front seam - useful for change, keys, car park ticket etc. Basic instructions provided and easy to wash. My test garment was in a darker colour that did have a tendency to pick-up any fluff during washing - so a little thought is needed about what else you put in the washing machine. The trousers dried very quickly and were just about OK to wear without ironing. Comfortable and flexible garment for social wear or for low level walking. Converts easily to excellently fitting shorts. Not really suitable for climbing or scrambling.